SCOUT is a tool which allows users to simultaneously search multiple databases using one search box. Scout returns results from the library's collection of print books, journals, audio, and DVDs, ebooks, and subscription databases, some open access content, and even some databases to which the library does not currently subscribe. Scout's default setting is "keyword" searching - which means it looks for your search terms everywhere. This may return a large number of results! To refine your result list to the most relevant items, use the limiters on the left-hand portion of the screen to restrict your results to "Full Text," "Academic Journals," or a specific date range or other type of material. You may also restrict by language or geographical area (for example, items that only pertain to the United States). 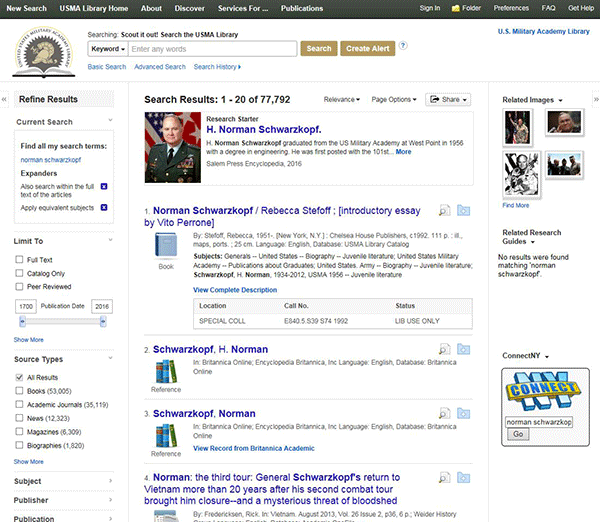 To get started using Scout, click here, and use the search box on the front page of the USMA Library website! Does Scout find all the Library's resources? SCOUT does not search everything. Due to a variety of issues, such as interface incompatibility or publisher competition, there are numerous databases and websites that cannot be integrated into this discovery tool, so they must be searched individually. View a full list of those databases here. Why are some items I find in Scout not available in full text? 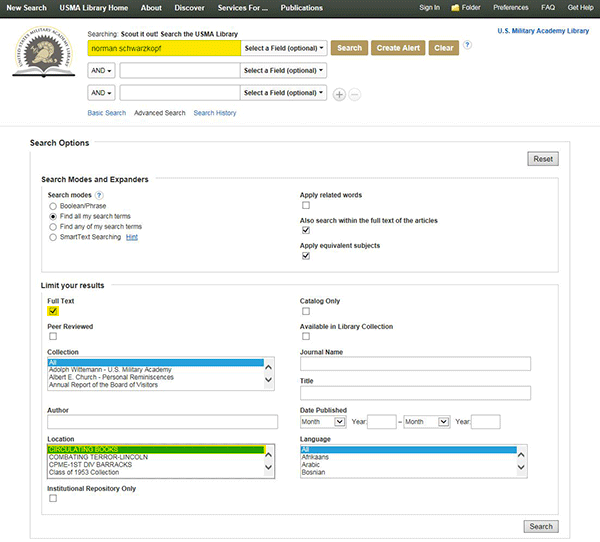 There are a few databases included in Scout that are not part of the USMA Library's collection of subscribed databases. However, including these databases increases your ability to discover a more complete record of existing research. Your librarians are happy to help you find the full-text versions of such articles and books you find when searching Scout through interlibrary loan. Can I still search individual databases? Yes. In fact, for research you'll do as an upper-level cadet, it is not ideal to rely solely on Scout. 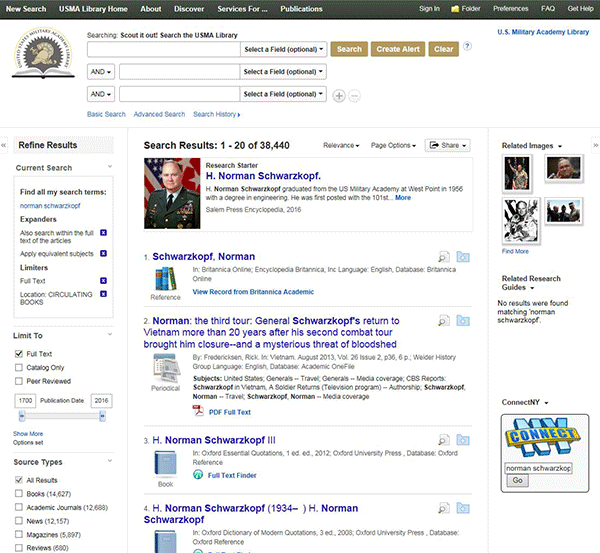 There are many databases offered through the USMA Library that are specific to the disciplines you will study here, and which have unique content, features, and interfaces. If you are searching for information specific to a particular field of study (law, for instance, or engineering), you may often find it more effective to use the database(s) that contain content specific to that particular subject or media type. A list of databases that are designed to complement specific areas of study can be found here. Just use the pull-down menu to choose your subject area. When you are using a computer or device that is connected to the West Point network, you will not be required to sign in to Scout. If you are on a computer or device not on our network, you can search for items, but you will be prompted to sign in when attempting to access any full text documents. Your sign in information will include your name and your "C" number (for cadets) or your DoD ID Number (for faculty and staff). If you do not remember your login or would like to set up an account please contact the library for assistance. The Basic Search Screen lets you create a search with limiters, expanders, and Boolean operators. Because of the customization options available with Scout, your interface options may vary. On the Basic Search Screen, enter your search terms in the Find field. If you want to use any of the optional Limiters or Expanders, click the Search Options link. You can use a specific search mode, such as"Find all of my search terms," or "SmartText Searching"; apply Limiters such as Full Text or Publication type; or use search options that expand your search, such as "Apply related words." To close the Search Options, click the link again. The Find field is displayed above the Result List. Your search terms, limiters, and expanders are retained. If included in your institution's Discovery Service subscription, you may see an real-time availability message included with your results. This will indicate whether the item is available at your institution or currently checked-out. Scout research interfaces allow users to conduct advanced searches using a Single Find field. The Single Find field offers ease of use to expert researchers who have developed more extensive search strategies. On the Advanced Search Screen, enter your search terms in the Find field. Note: Selecting Title will employ the Boolean/Phrase search mode while selecting Author will employ the Find all my search terms search mode. Limit your results – such as Full Text or Publication type. When searching Scout, if you receive a message that indicates no results were found, you may want to refine your search terms and try running the search again. Depending on the databases selected and how your library administrator has configured Scout, you may have expanders available. If so, try broadening your search to locate terms not only in the citation and abstract but also within the full text of the article. By marking the "Also search within full text of the article," you will expand the search. Depending on the databases selected and how your library administrator has configured Scout, you may have a thesaurus expander available. If so, try marking the "Also search for related words" expander. Scout's thesaurus will find synonyms, alternate spellings and plurals for your search terms. Try unmarking one or more limiters. Limiters narrow your result list—depending upon the limiters you've chosen, you may have created too narrow of a search. The Basic and Advanced Search Screens let you create a Boolean search with operators such as AND, OR and NOT. These searches are not designed to yield significant results if you enter long phrases or questions in everyday English. Reenter your search terms. Make sure you don't unnecessarily repeat words. There may be situations where you rerun a search and no results are found. If you run a search against a different database, the limiters and expanders you originally selected may not appear in the new database. If you run a search against the same database, but the database has changed, the limiters and expanders you originally selected may no longer be available in that database. Limiters let you narrow the focus of your search so that the information retrieved from the databases you search is limited according to the values you select. You can use more than one limiter if more than one is available. Full Text (Online) – Click to limit results to articles with full text available from databases, custom links, and local collections. Scholarly (Peer Reviewed) Journals – Limits search results to articles from peer-reviewed journals. Peer-reviewed journals are publications that include only those articles that have been reviewed and/or qualified by a selected panel of acknowledged experts in the field of study covered by the journal. Published Date – Use this option to search for articles within a specified date range. Create a range by using the drop-down lists to specify the months of the range and enter the last four digits of the year in the entry fields to specify the years of the range. Author – Enter an author's name to limit your search to items by a particular author. Location – Select one of the locations of your institution to limit results to items which can be found at that location. 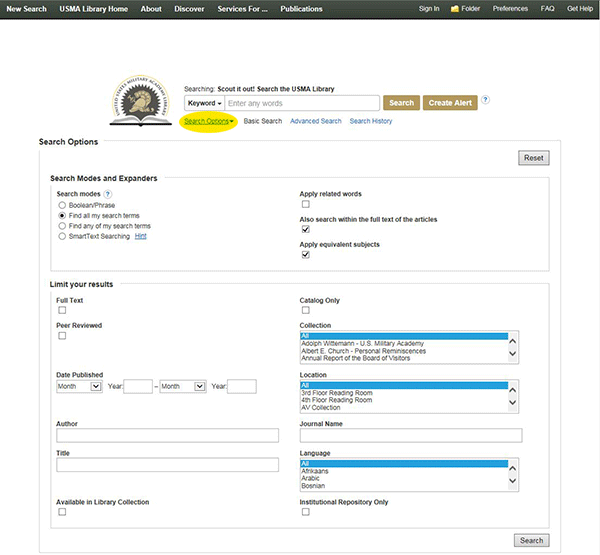 If multiple catalogs are available within your institution's EDS subscription, they are listed by location of the catalog. Multiple catalogs can be selected for your search by holding the Ctrl key and selecting catalogs. Title – Enter an article title or words from a title to limit your search to only items that match that title. Source – Enter the name of a publication to limit your search to only items from a particular publication. Abstract Available – Click to limit results to articles that include an abstract summarizing the contents of the article. Limiters do limit one another. If you select both Full Text and Cover Story limiters, the results that are retrieved include only Full Text items that are Cover Story items. The exception to this rule is the use of Full Text and Local Titles limiters. In this situation, use of these limiters produces a list of results that has Full Text or is part of a local collection. In the Find field, enter your search terms. Select the limiters you want to use from the Limit Your Results section of the search screen. Click Search. The Result List appears. Both database-specific limiters and global limiters are available to apply to your search term. When you search more than one database, the common limiters are displayed under the Limit Your Results heading. Other limiters may appear under the Special Limiters for: Database Name heading. Limiters are applied to your search with the AND operator. When you make multiple selections from within a limiter (such as Publication Type or Language) those selections are applied with the OR operator. Limiters are applied to the entire search, and appear at the end of the search with the AND operator. Searches from your current session are saved and numbered, starting with S1. You can combine saved searches by entering them in the Find field - for example, S1 and S2. When you do, the limiters from each search are applied to the new search. In either case, the limiters from both searches are included. You can search using the limiters in the Advanced Search Screen without entering a term in the Find field. This lets you search very specific types of information like Review Articles, or certain Publication Types. The limiters that are available depend on your selection of database, and they work to limit each other. For example, by selecting the Case Studies Publication Type and a date range, you could search your database for all Case Studies from 1999. You can also search using field codes to qualify your search terms. By entering the appropriate field codes in the Find field, you could search, for example, for items by a specific author published in a particular year ((AU Smith) and (YR 99)). The search appears in the Add to Search column, and is assigned a Search ID number. In the examples above, parentheses were used to show how searches are conducted by default in the Advanced Search Screen. Parentheses let you control a search query, and you can modify your searches by modifying their placement. If you do not use parentheses, terms with AND and NOT have priority over terms with or. If you use parentheses, elements that are enclosed in parentheses are executed first, and those parentheses appear in Search History and in the Find field. Results for these searches differ according to the grouping of the terms. When updating your result list using limiters and facets, you can apply items one at a time. With each limiter or facet you choose, the Result List updates automatically. You can also click Show More to apply multiple limiters or facets from a specific section (Source Types, Subjects, etc.) and click Update to refresh your Result List. As you select items to refine your search results, limiters and facets are added to the Current Search box below Refine Results. Simply click the x to remove a limiter or facet. After running your initial search query, select the Full Text limiter under Limit To. Your result list is refreshed with your limiter applied. Next, select a facet from the Refine Results column. Your results have been updated to reflect both the limiter as well as the facet. After running your initial search query, click the Show More link under Limit To and select a limiter from the resulting window. Click Search. The result list will be updated to reflect the applied limiter. Next, select a facet from the Refine Results column. Your results have been updated to reflect both the limiter as well as the facet.